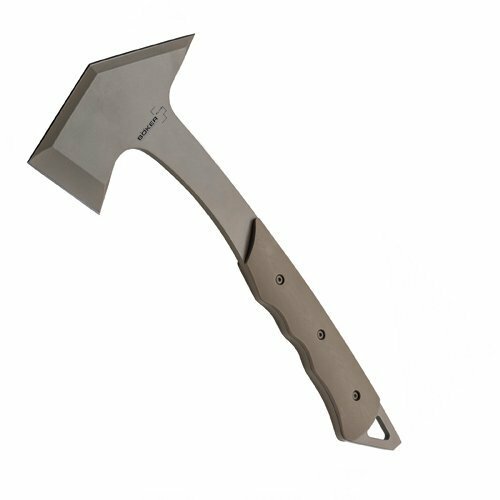 View More In Game Processing Axes, Saws & Kits. Jim Burke's past as a SWAT team member has placed him in countless situations where it was necessary to forcibly enter a room or building within seconds. His extensive experience from this, paired with his talent for knife design, brings us the ultimate tool - the Boker Plus Carnivore. Made form powder coated SK5 carbon steel and equipped with contoured G-10 scales, the Carnivore is frighteningly effective. Both the primary blade edge and the back tip are equally effective at working their way through just about any material. The slightly angled shape is the result of a biomechanical motion analysis conducted by Jim Burke alongside a scientist, in an attempt to obtain an optimum impact angle in relation to motion. Includes Kydex sheath. Head width: 6 1/2". Blade length: 2 2/12". Overall length: 14 1/4". Weight: 2.3 lbs. If you have any questions about this product by Boker Knives, contact us by completing and submitting the form below. If you are looking for a specif part number, please include it with your message.